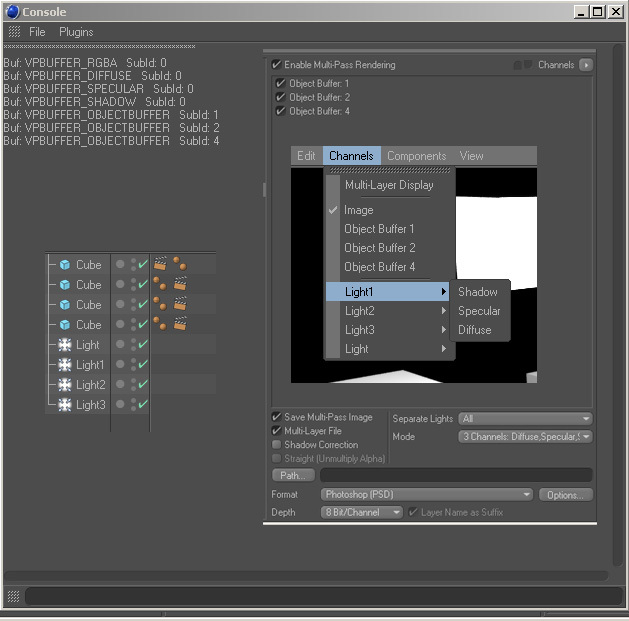 there is a way to get the array of VPBuffer if i set the render of each light and the array of the VPBuffer for all objects ID when i set multipass rendering? so myVpBufferrs _will be null if corrispondent multipass is not set. Maybe that my question is wrong? sorry, I can't quite follow you here. you only get a shdow, diffuse and specular pass for each light and an alpha pass for each object id. do you want access to these passes? > sorry, I can't quite follow you here. you only get a shdow, diffuse and specular pass for each light and an alpha pass for each object id. do you want access to these passes? Please ask your questions in a way I can follow you. What is it you want to achieve? From your last reply I was assuming the problem has been resolved. We both are not native English spekaers so please try to word your questions are bit more clearly. what i need is get all vpbuffer in the best way. I'm getting now the basic vpbuffer from render.. but seem that is better to get all them from Multipass.. I am not sure but could you not get all the information from the Multipass structure found in the PixelPost structure? Do you need the passes after or during rendering? So i need them in Execute..
Now..why all others lights layers are not in the list? Can't you help me on this? I don't know anything about VPBuffers. Here's how to browse through a multipass bitmap. For lights there is an inner loop that retrieves the data. but what do you mean about main bitmap? do i need to get it from Multipass::VPBitmap?